Form 941, Employer's Quarterly Federal Tax Return, is a basic form for reporting payroll tax activity to the Internal Revenue Service (IRS). Although at first glance Form 941 seems intimidating, after you have prepared it for several quarters, you will find it fairly simple to complete. Form 941 asks for information and takes you through a computation to match the total payroll tax you owe with amounts you have withheld from employees and amounts you have set aside and paid during the quarter. Form 941 is used by employers to report payroll tax activity to the IRS. The form is due quarterly at the end of the month after the end of each quarter. Employers must make payroll tax deposits during the quarter, either monthly or semi-weekly. Number of employees who received compensation for the quarter. Total compensation paid during the quarter to all employees. Be sure to include all taxable compensation in this amount. Total income tax withheld from compensation during the quarter. Total taxable social security and Medicare compensation for the quarter. Be sure you have not included social security withholding above the maximum for the year, and that you have included the additional Medicare tax amount withheld from high-pay employees. Total quarter adjustment for sick pay and group-term life insurance. Total advance earned income credit (EIC) payments to employees for the quarter. Total COBRA premium assistance payments made during the quarter. Total payroll tax liability, not deposits, for each month of the quarter. Check the social security maximum for the year, as it changes annually. No withholding of social security is taken from employee wages above this amount. Account for the additional Medicare tax for higher-income employees. Line 1: The number of employees who were paid during the quarter. Line 2: The total compensation paid to these employees during the quarter. Line 3: Total income tax withheld from employee compensation during the quarter. Line 4: If no employee compensation was subject to social security or Medicare tax, check the box and skip to task 4. Line 5a: Enter total taxable social security wages in Column 1, multiply by .124, and enter the amount in Column 2. Remember that social security wages are paid only up to the annual social security maximum amount for each employee. Line 5b: Do the same as 5a for tips. Line 5c: Enter total taxable Medicare wages and tips in column 1, multiply by .029, and enter the result in Column 2. Add Column 2 amounts from 5a, 5b, and 5c, and enter the total in 5d. Compute the total tax. To determine the amount of tax you owe, add the totals for Line 3—tax withheld, Line 5d: total social security and Medicare tax due, and subtract line 6d: HIRE Act exemption. Enter the total on Line 6e. Line 7a: Adjustment for fractions of cents. Use traditional rounding— under 1/2, round down; half or more, round up. Use the negative sign, not parentheses, for decreases. Line 7b: Subtract any social security or Medicare withheld from sick pay by third-party payers such as insurance companies. Line 7c: Subtract adjustments for the uncollected employee share of social security and Medicare taxes on tips, and on group-term life insurance premiums paid for former employees. Line 8: Total these adjustments (6e through 7c) and enter the amount on Line 8. Total the deposits. On Line 11, enter the total for all payroll tax deposits you made during the quarter. Total the adjustments. Add Line 11: total deposits, Line 12a: COBRA premium assistance payments, and Line 12e: adjustment for social security tax on COBRA assistance. If Line 10, total taxes, is greater than Line 13, total deposits with adjustments, enter the balance due on Line 14. If Line 10, total taxes, is less than Line 13, total deposits with adjustments, enter the overpayment amount on Line 15. You may either apply the overpayment to the next return or request a refund. You must provide information about your payroll deposit schedule. If you are a monthly depositor, you must enter the tax liability for each month in the quarter. If you are a semiweekly depositor, you must attach Schedule B: Form 941, showing the tax liability for each semiweekly deposit. Your tax liability is NOT your deposits for each quarter. Your tax liability is the total tax you owe based on gross payroll for each month. Your tax liability for the quarter must equal the total on Line 10. Answer the questions about your business, on lines 18 and 19, or leave them blank if they don't apply. Part 4 asks if the IRS may communicate with your third-party designee. This is the person who prepared your Form 941 and who is responsible for the preparation of payroll taxes. You must sign the form and enter the other information in Part 5 before sending in the form. IRS Form 941 Instructions (PDF) will provide more detailed information. Note that due dates may vary because if the date falls on a holiday or weekend, the due date will be the next business day. 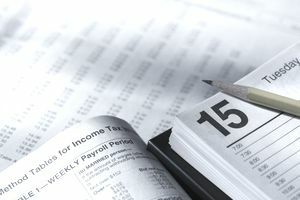 It's a good idea to set up a yearly payroll tax calendar to keep track of important dates. Check all of your calculations and the numbers you submit to the IRS. For example, the IRS has a record of all your payroll tax deposits, so if the amounts you say you deposited don't match the deposits you actually made, you may have a problem. Check Form 941 for errors. Don't try to fix errors you already made on deposits; you will need to submit Form 941-X to fix this type of error. Answer all questions, or enter "N/A" or "Not Applicable" or with a value of "0." It's never a good idea to leave any blanks on this type of form. Make sure all of your numbers match, particularly the tax liability number on Line 10 versus the tax liability total on Line 17. A mismatch can cause your 941 to be rejected or subject you to fines. Be sure to put your company name and Employer ID Number (EIN) at the top of the second page for identification purposes. Having all of the requested information on hand prior to filling out Form 941, should simplify the process and help to ensure that the information you provide is accurate.